The Spaniards first brought the word tortilla (from torta, "cake") to Mexico; the Mexicans, in turn, used it to describe their flat corn and flour cakes. The bread staple of the Mexican diet, all tortillas were originally made from the pulp of ground corn, the native grain of the New World. When the Spanish brought wheat to the New World, white flour tortillas became prevalent. Corn tortillas, now mostly machine-made, still hold the highest nutritional value. Cut into wedges and deep fried, these flat cakes became tortilla chips. After tortilla products were first introduced in the United States by Latin Americans living in the southwestern states, the popularity of new food item spread rapidly. Tortilla chips can come in many different sizes and shapes, such as triangles, rounds, and rectangular strips. The seasonings of tortilla chips can vary greatly, and they can be eaten with a variety of salsas and toppings. The basic method of tortilla and tortilla chip production has changed little since ancient times. Traditional tortilla preparation involves cooking the corn in pots over a fire, steeping (soaking) for 8 to 16 hours, pouring off the cooking liquor or nejayote, and washing the nixtamal (the end product of the cooking, steeping, and washing/draining process). The nixtamal is then ground into masa (dried and ground corn flour) with hand-operated grinders or metates (grinding stones). The masa is either hand-molded or molded using a tortilla press to form thin disks, which are then baked on a hot griddle called a comal. One of the most important industrial advancements has been the production of dry masa flour, a shelf-stable product. This dry flour has become popular because it meets standards for certain applications, reduces requirements for energy, labor, floor space, processing time, and equipment, and is convenient and easy to use. When compared with fresh masa flour, however, foods made from dry masa flour tend to be less flavorful and the cost per unit is higher. Smaller manufacturers that supply local restaurants with tortilla chips usually use dry masa flour, while larger manufacturers use fresh masa flour that is produced on-site. Tortilla chips are made using yellow corn, white corn, flour, whole wheat, or blue cornmeal. Coarse masa is used in making corn tortilla chips. Masa consists of corn that has been soaked in a food-grade lime and water solution to break down the hulls; the kernels are then ground into flour. Frying oil, salt, and various seasonings complete the list of main ingredients. Other ingredients, such as preservatives, emulsifiers, gums, and acidulants, are used mainly in the United States to improve shelf life and to maintain certain properties of the product. The characteristics of the raw material determine the tortilla chips' quality, cooking parameters, and color. To make tortilla chips, manufacturers first mix the raw ingredients—water, moist corn, and lime—to form the masa or dough. Next, the mixture is heated in a large kettle such as a Hamilton kettle, which is heated indirectly by steam. After steeping, which allows water to be absorbed, the solution is washed and pumped onto a conveyor belt for transport to the grinder. added together in a large industrial cooker. The lime is used primarily as an aid in removing the pericarp (hull or skin) during cooking and steeping. The lime also helps to increase the product shelf life by controlling microbial activity, and it affects the flavor, aroma, color, and nutritional value of the chips. 2 This mixture is then batch-cooked in either a Hamilton steam kettle or a vertical closed cooker. The Hamilton kettle is indirectly heated by steam, and the grain contents are mechanically agitated. It is designed for cooking at or near the boiling point of the lime-water-corn solution. An elaborate agitation system ensures the uniform transfer of heat by condensing steam through the kettle wall and into the limewater-corn solution. The capacity of these steam-jacketed kettles ranges from 300 to 595 pounds (136 to 270 kilograms). The vertical closed cooker uses direct steam injection to heat and agitate the lime-water-corn solution in a large tank, which serves for both cooking and steeping. Additional agitation is accomplished with compressed air. Because this system is designed for cooking at temperatures well below the solution boiling point (185 degrees Fahrenheit or 85 degrees Celsius), the cooking time is longer than in the Hamilton steam kettles. The capacity of the vertical cookers ranges from 3,000 to 6,000 pounds (1,360 to 2,730 kilograms). Cooking time can vary greatly from a few minutes to a half hour, depending upon which system is used. In general, temperatures above 155 degrees Fahrenheit (68 degrees Celsius) are considered to be the optimum cooking temperatures. Cooking depends on the characteristics of the corn and the interaction of time, temperature, lime concentration, cooking vessel size, and agitation. Nixtamal used for fried products is generally cooked less than nixtamal used for table tortillas. 3 Immediately after cooking, the solution is quenched (rapidly cooled) to about 154 to 162 degrees Fahrenheit (68-72 degrees Celsius). This lower temperature decreases water absorption during the steeping process and the cooking time of the nixtamal. The result is a more consistent masa, which absorbs less oil during frying. 4 The grain is then steeped for 8 to 16 hours in the cooking vat (if a vertical cooker was used) or transferred to a holding vat (if a Hamilton steam kettle was used). The steeping process allows water to be absorbed, which helps to disintegrate the hull and soften the kernel. During the steeping process, the temperature is dropped to 104 degrees Fahrenheit (40 degrees Celsius). 5 After steeping, the solution is pumped into the washers. The cooking liquor is drained off, and the resulting nixtamal is washed with pressurized water or spraying systems. Most of the pericarp and excess lime is removed during this step. Washing in commercial processes is done in two types of equipment: the drum washer and the "lowboy" system. 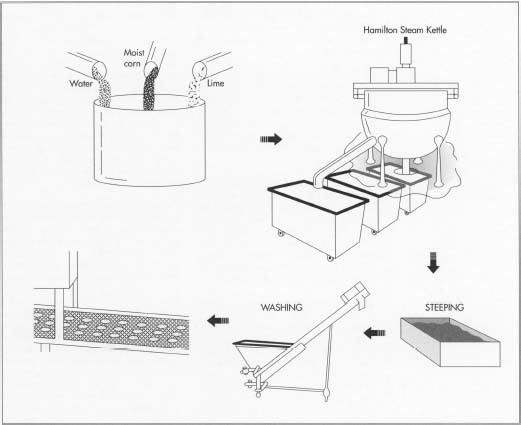 A drum washer consists of a conveyor that transports the nixtamal into a rotating perforated cylinder with internal flights and water sprayers located within the drum. After spraying, the nixtamal passes into a drain conveyor, where the excess water is removed. The lowboy system consists of a receptacle equipped with internal screens and sprayers. The washed nixtamal is continuously removed from the bottom of the receptacle by an inclined belt conveyor. In both systems, a conveyor transports the washed, drained nixtamal into a hopper, which then feeds the stone grinder. The end result, using the typical corn and lime mixture, will be 54 ounces (1.53 kilograms) of 47 percent moist nixtamal. 6 The washed nixtamal is then ground using two matched carved stones, one stationary and the other rotating at about 500 to 700 rpm. The stones are usually composed of lava or volcanic materials, although they can also consist of synthetic materials made of aluminum oxide (Ak203). For optimum efficiency, the lava stones must be frequently recarved; the synthetic stones last longer and require less recarving. A typical stone is 10 centimeters thick and 40 centimeters in diameter and has radial grooves. The grooves become more shallow as they approach the perimeter of the stone. The number, design, and depth of the grooves in the stones vary with the intended product: stones carved for the production of table tortillas have more shallow grooves to produce a finer masa, whereas coarser masa for tortilla chips comes from deeper-grooved stones. The grinding or milling starts when a screw conveyor at the base of the hopper forces the nixtamal through a center opening and into the gap between the stones, where shearing occurs. The material travels outward from the center to the perimeter of the stones. Water added during milling cools the stones, prevents excessive wear, and reduces the masa temperature. For a grinder with a capacity of 600 kg/hr, about 0.6 to 1.2 liters of water per minute (0.16-0.32 gpm) is added. This amount of water increases the masa moisture content to the optimum for sheeting. Like the grinding stones, the moisture content depends upon the resulting product. The masa particle size is the result of several interacting factors: degree of nixtamal cooking; size and depth of the grooves in the grinding stones; gap or pressure between the grinding stones; amount of water used. during milling; and the type of corn used. The grinding breaks up the kernel structure and promotes "plastic" and cohesive properties in the masa. Once the masa is produced, it is important to use it immediately or to protect it against moisture loss. After grinding, the resulting mixture will be 1.65 kilograms of 51 percent moist coarse masa. The washed solution is ground using two matched carved stones, one stationary and the other rotating. From there, the resulting coarse masa is cut into actual chips. The masa is fed onto a pair of smooth rollers, usually coated with Teflon, one rotating counterclockwise and the other clockwise. The masa is forced between the rolls, cut, and discharged into the oven for baking. After frying and seasoning, the chips are packaged accordingly. coated with Teflon, one rotating counter-clockwise and the other clockwise. The gap between the rollers is adjustable, so that products of different thicknesses can be produced. The masa is forced between the rolls and separated by wires located on the front and back rolls. The back wire cleans the sheeted masa from the back roll and allows it to adhere to the front roll, and the front wire or wires strip the masa pieces from the roll. The cutter rotates underneath the front roll. Different cutter configurations (triangular, circular, rectangular, etc.) are used for various products. Copper or plastic bands surround the end of the first roll and help to recycle excess masa. The masa pieces leave the front roller on a discharge belt, which feeds directly into the oven. 8 A three-tiered gas-fired oven is used to bake the formed masa. Generally, the chips are baked at temperatures ranging from 500 to 554 degrees Fahrenheit (260-290 degrees Celsius), with the baking time varying from 35 to 50 seconds. Baking enhances the alkaline flavor and reduces moisture and oil absorption during frying. 9 The tortilla chips are then cooled by moving through a series of open tiers or cooling racks. The chips are sometimes cooled for up to 20 minutes before frying to produce a more uniform consistency and to reduce blistering during frying. During this cooling process, the chips lose additional moisture (up to 3 percent), and the moisture within each chip becomes more evenly distributed. 10 The next step involves frying the chips using oil temperatures ranging from 338 to 374 degrees Fahrenheit (170-190 degrees Celsius) for 50 to 80 seconds. The frying temperature and time depend on the type of product. Tortilla chips made from yellow corn require a lower frying temperature and a longer time than chips made from white or blended white and yellow corn. For example, corn chips made from yellow corn are fried at 320 degrees Fahrenheit (160 degrees Celsius), while those made from blended white and yellow corn are fried at temperatures up to 410 degrees Fahrenheit (210 degrees Celsius) for 60 to 90 seconds. Most of the commercial fryers used are the continuous type with direct or indirect heating elements. Indirect-fired fryers are more expensive but more efficient, with lower operational costs. Modern fryers are designed to filter out fines (very small pieces) continuously and be easy to clean. These commercial fryers are available in sizes that can process from 160 to 1,360 kg/hr (353-3,000 lbs/hr). The process yield, using the typical corn/lime mixture, will be 0.96 kilograms (2.1 pounds) of tortilla chips, with 22 to 24 percent oil and less than 2 percent moisture. 11 The salt and seasonings are applied immediately after frying while the chips are still hot. The hot chips are conveyed into an inclined rotating cylinder, where a liquid seasoning mix is sprayed on them. Generally, the liquid mix consists of hot oil, salt, seasonings, and flavoring and coloring agents. Upon cooling, the oil crystallizes, forming the seasoning coat. Salt can also be deposited on the chips as a liquid spray or by a granulated salt dispenser positioned over the conveying belts after the tumbling operation. The amount of salt usually added to tortilla chips is about 1 to 1.5 percent by weight. 12 The tortilla chips are then cooled to ambient temperature and immediately packaged in moistureproof bags. Because fried products are very hygroscopic (they readily absorb and retain moisture), delayed packaging can cause a loss of crispness. The cooled tortilla chips, with about 1.5 percent moisture, are conveyed into a bagging machine. This machine automatically weighs and deposits them in a bag, which is then sealed. The quality control aspect of tortilla chip production is essential so that the chips can reach the customer at their freshest. 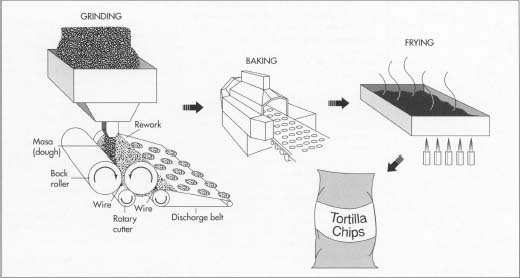 The major parameters controlled during tortilla chip production are: temperature and relative humidity of corn silos and storage rooms for ingredients and products; the cooking, quenching, steeping, baking, and frying times and temperatures; types of grinding stones and their adjustment during milling; moisture content of the corn, nixtamal, masa, and, finally, the tortilla chips; operating condition of the equipment (such as the cooker, sheeter, oven, fryer, cooling rack, packaging equipment, etc. ); frying oil and product deterioration; and the sanitation of equipment and personnel. The future trends for the corn and tortilla chip market are toward thinner, lighter, and smaller chips. Recently, tortilla chips made from white corn, whole wheat flour, and the blue cornmeal of the Southwest have become available and increasingly popular. Combinations of masa flour with wheat, legumes, and other flours will lead to interesting new products. New products fried with oils containing more unsaturated fatty acids or made from nutritionally improved corn will enhance the image of tortilla chips. Modified frying and new baking techniques that produce foods with a texture like that of fried foods will be used to make lower calorie snacks. The industry will move toward higher-speed production lines, more automation, better quality control, and higher labor and equipment efficiency. It is estimated that the consumption of tortilla chips will continue to increase in the United States. Corn and tortilla chips are becoming popular in other areas of the world as well. Corn chip plants have been started in Australia, the People's Republic of China, India, Korea, and other countries. Experiencing a 50 percent increase in wholesale sales during the past five years, corn and tortilla snacks are rapidly moving into main-stream popularity. Future growth, however, depends on the industry's ability to keep pace with changing consumer demands. Booth, R. Gordon. Snack Food. Van Nostrand Reinhold, 1990. Gleason, Carolyn J. Handbook of Mexican American Foods: Recipes, Nutritional Analysis, Diabetic Exchanges & Common Practices. Intercultural Development Research Association, 1982. Matz, Samuel A. Snack Food Technology. Pan-Tech International, 1993. Sparks, Pat and Barbara Swanson. Tortillas! St. Martin's Press, Inc., 1993. Wise, Victoria and Susanna Hoffman. The Well-Filled Tortilla Cookbook. Workman Publishing, 1990, pp. 32-33.
de Lisser, Eleena. "Tortilla Chips Tempt Snackers With Changes," Wall Street Journal. May 6, 1993, p.B1. "Thin Tortilla Chips," Fortune. October 19, 1992, p. 109. Mack, Toni. "Tortilla Wizard," Forbes. July 20, 1992. Serna-Saldivar, S. O., M. H. Gomez, and L. W. Rooney. "Technology, Chemistry, and Nutritional Value of Alkaline-Cooked Corn Products," Advances in Cereal Science & Technology. 1990, pp. 243-307.